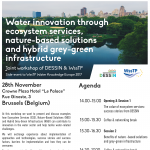 The scope of the workshop is to underline how ESS, NBS and HGGI best practices, approach and methodologies can contribute to innovation in the water sector and help tackle water-related challenges, such as water quality and water scarcity. Three dedicated sessions will highlight experiences on implementation, success stories and success factors, as well as barriers to implementation and how they can be overcome. Also discussed will be possible ways forwards for scaling up and market uptake, actions to be taken and implications for future European innovation activities in the field. The workshop will take place on the afternoon of 28th November, with plenary presentations on project results, and interactive discussion rounds on lessons learnt and possible ways forward to foster broad implementation of ESS, NBS and HGGI solutions. Water supply and sanitation services suppliers, water boards, water technology providers, policy and decision makers, researchers and innovation enablers are invited to participate.